Never leave a chain, collar or lead on your dog. I stress never. The only collar should be a close fitting collar with his name tag on. NO OTHER CHAINS RESTRAINERS OR LEADS. Many dogs have strangled themselves trying to get out. They can get themselves into such a mess when leads get entangled with gear sticks, seat belts and dog guards. Be aware. Under no circumstances should you leave your dog in a car in hot weather. You are breaking the law and can be prosecuted for cruelty. The sooner you take your dog with you in the car the better. 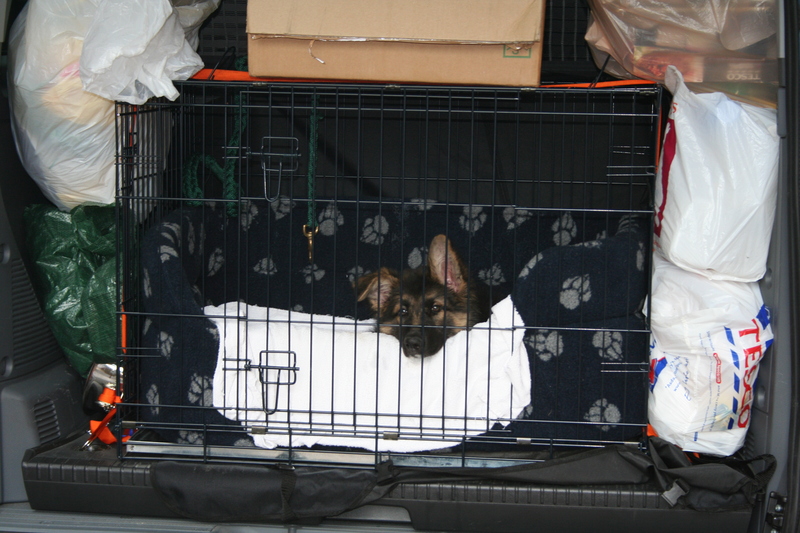 If you have a puppy, then everyday taking the puppy for short journeys will soon get him used to the car. The same applies to an older dog. If you take your dog out in the car only now and again, then this can cause the dog to be sick. Do not be surprised and be prepared. Before you start your journey, put plenty of newspaper where your dog is travelling. Make sure you have plenty of water and while you are on the road, make frequent stops for you to walk your dog, this can help the dog. Don’t and I stress don’t, feed your puppy or dog before a journey. It stands to reason if the stomach is empty very little or nothing will be regurgitated. If your puppy keeps on retching for any length of time, it could cause a STOMACH TORSION or twist. A stomach twist or torsion can happen with large Breeds, or it can cause gastro entiritis. Because with constant retching, the stomach can be inflamed and the retching can be accompanied by diarrhoea. That is why it is best to take your puppy on small but frequent journeys to start with. If this happens, stop the car and give the puppy or dog chance to stop retching take them out of the car and let them stand quietly. The dog is in obvious distress. Veterinary attention should be sought immediately. This condition can be fatal so contact a Vet. Keep your mobile phone on you with your Vet’s number on it. If you need a Vet immediately contact the local Police station and they will help you. Most dogs take to the car like a duck to water and love to travel with you. I know of handlers that take their dogs with them on most journeys. I can remember at my Supermarket at least five cars who, on a regular basis parked up with their dogs in the back and dogs will settle in a car for a considerable length of time providing they can stretch their legs and the windows allow enough fresh air in. They will quite happily sit and watch the world go by. There is unfortunately the dog who cannot sit in the car without sickness, some are sick once, others quite afew times. These dogs can have treatment in the form of tablets. These can either be from the Vets or from your pet shop. The only complaint that dog owners have is that they tend to knock some dogs out. One way of getting your dog used to the car is while it is parked on the drive, but your dog in it to get the feel of the car without the stress of moving. This can help a dog who gets over excited in the car. He soon settles down when he realises that you are going nowhere. Do this everyday and the car will be no big deal. The dog is allowed to jump around inside the car. If you have any problems, email us for advice.